R. Aaij et al. (the LHCb collaboration). 14/12/2015. LHCb-PAPER-2015-051. arXiv:1512.04442 [hep-ex]. JHEP 02 (2016) 104. Citations. P. Koppenburg et al. (the Belle collaboration). 02/03/2004. arXiv:hep-ex/0403004. Phys. Rev. Lett. 93, 061803 (2004). 500+ Citations. R. Aaij et al. (the LHCb collaboration). 04/06/2014. LHCb-PAPER-2014-020. arXiv:1406.0755 [hep-ex]. JHEP 07 (2014) 103. Citations. R. Aaij et al. (the LHCb collaboration). 16/04/2013. LHCb-PAPER-2013-015. arXiv:1304.4500 [hep-ex]. Nucl. Phys. B 873 (2013) 275. Citations. K. De Bruyn, R. Fleischer, R. Knegjens, P. Koppenburg, M. Merk, A. Pellegrino, N. Tuning. 08/04/2012. arXiv:1204.1737 [hep-ph]. Phys. Rev. Lett. 109 041801 (2012). 200+ Citations. K. De Bruyn, R. Fleischer, P. Koppenburg. 03/12/2010. arXiv: 1012.0840 [hep-ph]. Proceedings of CKM2010, the 6th International Workshop on the CKM Unitarity Triangle, University of Warwick, UK, 6-10 September 2010. Citations. R. Aaij et al. (the LHCb collaboration). 07/03/2017. LHCb-PAPER-2016-003. arXiv:1703.02508 [hep-ex]. Article submitted to Phys.Rev.Lett. R. Aaij et al. (the LHCb collaboration). 26/02/2017. LHCb-PAPER-2016-056. arXiv:1702.08048 [hep-ex]. Article submitted to JHEP. R. Aaij et al. (the LHCb collaboration). 30/01/2017. LHCb-PAPER-2016-049. arXiv:1701.08705 [hep-ex]. Article submitted to JHEP. R. Aaij et al. (the LHCb collaboration). 19/01/2017. LHCb-PAPER-2016-054. arXiv:1701.05501 [hep-ex]. Article submitted to Phys. Rev. D .
R. Aaij et al. (the LHCb collaboration). 18/01/2017. LHCb-PAPER-2016-064. arXiv:1701.05116 [hep-ex]. Article submitted to Phys.Rev.Lett. R. Aaij et al. (the LHCb collaboration). 07/01/2017. LHCb-PAPER-2016-041. arXiv:1701.01871 [hep-ex]. Article submitted to Phys. Lett. B.
R. Aaij et al. (the LHCb collaboration). 23/12/2016. LHCb-PAPER-2016-060. arXiv:1612.08110 [hep-ex]. Article submitted to JHEP. R. Aaij et al. (the LHCb collaboration). 22/12/2016. LHCb-PAPER-2016-057. arXiv:1612.07451 [hep-ex]. Article submitted to JHEP. R. Aaij et al. (the LHCb collaboration). 20/12/2016. LHCb-PAPER-2016-045. arXiv:1612.06764 [hep-ex]. Article submitted to Eur. Phys. J. C.
R. Aaij et al. (the LHCb collaboration). 15/12/2016. LHCb-PAPER-2016-031. arXiv:1612.05140 [hep-ex]. Phys. Rev. Lett. 118, 052002 (2017). R. Aaij et al. (the LHCb collaboration). 07/12/2016. LHCb-PAPER-2016-050. arXiv:1612.02244 [hep-ex]. Phys. Rev. Lett. 118, 071801 (2017). R. Aaij et al. (the LHCb collaboration). 23/11/2016. LHCb-PAPER-2016-048. arXiv:1611.07805 [hep-ex]. Article submitted to JHEP. R. Aaij et al. (the LHCb collaboration). 18/11/2016. LHCb-PAPER-2016-033. arXiv:1611.06143 [hep-ex]. Article submitted to Phys. Rev. D .
R. Aaij et al. (the LHCb collaboration). 31/10/2016. LHCb-PAPER-2016-035. arXiv:1610.09476 [hep-ex]. Phys. Lett. B 767 (2017) 177. R. Aaij et al. (the LHCb collaboration). 26/10/2016. LHCb-PAPER-2016-036. arXiv:1610.08288 [hep-ex]. Phys. Rev. Lett. 118 081801 (2017). R. Aaij et al. (the LHCb collaboration). 17/10/2016. LHCb-PAPER-2016-028. arXiv:1610.05187 [hep-ex]. Phys. Rev. D 95 012006 (2017). R. Aaij et al. (the LHCb collaboration). 07/10/2016. LHCb-PAPER-2016-042. arXiv:1610.02230 [hep-ex]. Article submitted to JHEP. R. Aaij et al. (the LHCb collaboration). 16/09/2016. R. Aaij et al. (the LHCb collaboration). 11/09/2016. LHCb-PAPER-2016-014. arXiv:1609.03124 [hep-ex]. Eur. Phys. J. C (2016) 76: 664. R. Aaij et al. (the LHCb collaboration). 23/08/2016. LHCb-PAPER-2016-037. arXiv:1608.06620 [hep-ex]. Phys. Rev. Lett. 117 261801 (2016). R. Aaij et al. (the LHCb collaboration). 04/08/2016. LHCb-PAPER-2016-023. arXiv:1608.01478 [hep-ex]. Phys. Lett. B 765 (2017) 307..
R. Aaij et al. (the LHCb collaboration). 03/08/2016. LHCb-PAPER-2016-026. arXiv:1608.01289 [hep-ex]. Phys. Rev. D 94 072001 (2016). R. Aaij et al. (the LHCb collaboration). 25/07/2016. LHCb-PAPER-2016-020. arXiv:1607.06823 [hep-ex]. JHEP 09 (2016) 153. R. Aaij et al. (the LHCb collaboration). 21/07/2016. LHCb-PAPER-2016-016. arXiv:1607.06446 [hep-ex]. Article submitted to Phys.Lett.B. LHCb-PAPER-2016-022. arXiv:1607.06134 [hep-ex]. Phys. Rev. D 94 091102(R) (2016). R. Aaij et al. (the LHCb collaboration). 27/06/2016. LHCb-PAPER-2016-018. arXiv:1606.07895 [hep-ex]. Phys. Rev. Lett. 118 022003 (2017). R. Aaij et al. (the LHCb collaboration). 15/06/2016. LHCb-PAPER-2016-012. arXiv:1606.04731 [hep-ex]. JHEP 11( 2016) 047. R. Aaij et al. (the LHCb collaboration). 04/05/2016. LHCb-PAPER-2016-007. arXiv:1605.01082 [hep-ex]. JHEP 08 (2016) 137. R. Aaij et al. (the LHCb collaboration). 19/04/2016. LHCb-PAPER-2016-009. arXiv:1604.05708 [hep-ex]. Phys. Rev. Lett. 117, 082002 (2016). R. Aaij et al. (the LHCb collaboration). 12/04/2016. LHCb-PAPER-2015-031. arXiv:1604.03475 [hep-ex]. Eur. Phys. J. C 76 (2016) 41. R. Aaij et al. (the LHCb collaboration). 06/04/2016. LHCb-PAPER-2016-008. arXiv:1604.01412 [hep-ex]. Phys. Rev. D 93 092007 (2016). R. Aaij et al. (the LHCb collaboration). 23/03/2016. LHCb-PAPER-2015-060. arXiv:1603.06961 [hep-ex]. JHEP 05 (2016) 132. R. Aaij et al. (the LHCb collaboration). 15/03/2016. LHCb-PAPER-2016-005. arXiv:1603.04804 [hep-ex]. Phys. Rev. Lett. 116, 241601 (2016). R. Aaij et al. (the LHCb collaboration). 08/03/2016. 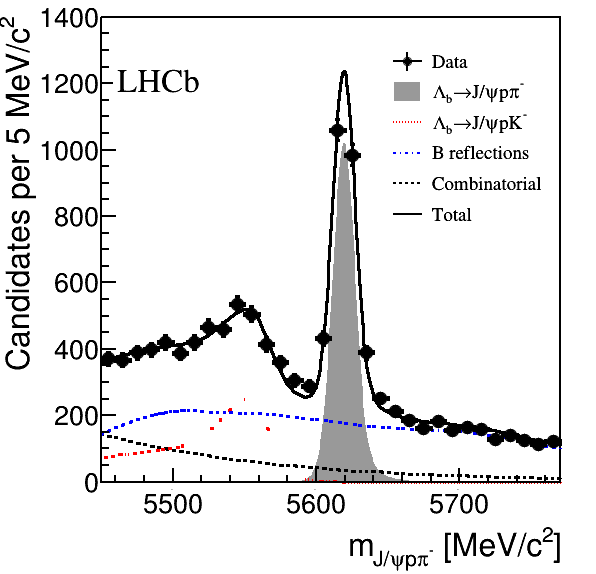 LHCb-PAPER-2015-050. arXiv:1603.02408 [hep-ex]. Phys. Rev. Lett. 116, 161802 (2016). R. Aaij et al. (the LHCb collaboration). 24/02/2016. LHCb-PAPER-2015-053. arXiv:1602.07543 [hep-ex]. Phys. Rev. D 93, 092008 (2016). R. Aaij et al. (the LHCb collaboration). 23/02/2016. LHCb-PAPER-2015-057. arXiv:1602.07224 [hep-ex]. Phys. Rev. Lett. 116, 241801 (2016). R. Aaij et al. (the LHCb collaboration). 09/02/2016. LHCb-PAPER-2015-055. arXiv:1602.03160 [hep-ex]. Phys. Rev. Lett. 116, 191601 (2015). Read the CERN courier article. R. Aaij et al. (the LHCb collaboration). 20/01/2016. R. Aaij et al. (the LHCb collaboration). 08/12/2015. LHCb-PAPER-2015-054. arXiv:1512.02494 [hep-ex]. Phys. Rev. D 93 051101(R). R. Aaij et al. (the LHCb collaboration). 01/12/2015. LHCb-PAPER-2015-048. arXiv:1512.00322 [hep-ex]. Phys. Lett. B 754 (2016) 167. R. Aaij et al. (the LHCb collaboration). 28/10/2015. LHCb-PAPER-2015-043. arXiv:1510.08367 [hep-ex]. Phys. Lett. B 757 (2016) 558. R. Aaij et al. (the LHCb collaboration). 16/10/2015. LHCb-PAPER-2015-044. arXiv:1510.04866 [hep-ex]. Phys. Rev. D 92, 112002 (2015). R. Aaij et al. (the LHCb collaboration). 07/10/2015. LHCb-PAPER-2015-038. arXiv:1510.01951 [hep-ex]. Phys. Rev. D 92, 112009 (2016). R. Aaij et al. (the LHCb collaboration). 06/10/2015. LHCb-PAPER-2015-042. arXiv:1510.01664 [hep-ex]. JHEP 04 (2016) 033. R. Aaij et al. (the LHCb collaboration). 22/09/2015. LHCb-PAPER-2015-026. arXiv:1509.06628 [hep-ex]. Phys. Rev. D 93, 052018 (2016). R. Aaij et al. (the LHCb collaboration). 02/09/2015. LHCb-PAPER-2015-037. arXiv:1509.00771 [hep-ex]. JHEP 10 (2015) 172. Read the news on the LHCb web site or my CERN courier article. R. Aaij et al. (the LHCb collaboration). 01/09/2015. LHCb-PAPER-2015-034. arXiv:1509.00400 [hep-ex]. JHEP 11 (2015) 082. R. Aaij et al. (the LHCb collaboration). 25/08/2015. LHCb-PAPER-2015-030. arXiv:1508.06087 [hep-ex]. JHEP 10 (2015) 055. R. Aaij et al. (the LHCb collaboration). 04/08/2015. LHCb-PAPER-2015-028. arXiv:1508.00788 [hep-ex]. JHEP 10 (2015) 053. R. Aaij et al. (the LHCb collaboration). 13/07/2015. LHCb-PAPER-2015-024. arXiv:1507.03516 [hep-ex]. Phys. Rev. D 92, 072007 (2015). R. Aaij et al. (the LHCb collaboration). 01/07/2015. LHCb-PAPER-2015-002. arXiv:1506.09173 [hep-ex]. Eur. Phys. J. C (2015) 75. R. Aaij et al. (the LHCb collaboration). 30/06/2015. LHCb-PAPER-2015-018. arXiv:1506.08634 [hep-ex]. JHEP 01 (2016) 012. R. Aaij et al. (the LHCb collaboration). 02/06/2015. LHCb-PAPER-2015-022. arXiv:1506.00903 [hep-ex]. Phys. Rev. Lett. 115 112001 (2015). R. Aaij et al. (the LHCb collaboration). 26/05/2015. LHCb-PAPER-2015-020. arXiv:1505.07044 [hep-ex]. Phys. Rev. D 92 112005 (2015). R. Aaij et al. (the LHCb collaboration). 15/05/2015. LHCb-PAPER-2015-021. arXiv:1505.04051 [hep-ex]. Phys. Rev. D 92, 052001 (2015). R. Aaij et al. (the LHCb collaboration). 07/05/2015. LHCb-PAPER-2014-070. arXiv:1505.01710 [hep-ex]. Phys. Rev. D 92 032002 (2015). LHCb-PAPER-2015-017. arXiv:1505.01505 [hep-ex]. Phys. Rev. D 92, 012012 (2015). R. Aaij et al. (the LHCb collaboration). 23/04/2015. LHCb-PAPER-2015-015. arXiv:1504.06339 [hep-ex]. Phys. Rev. D 92, 011102. R. Aaij et al. (the LHCb collaboration). 07/04/2015. LHCb-PAPER-2015-013. arXiv:1504.01568 [hep-ex]. Nature Physics 11 (2015) 743. Read the news on the LHCb web site. R. Aaij et al. (the LHCb collaboration). 26/03/2015. LHCb-PAPER-2015-006. arXiv:1503.07770 [hep-ex]. Phys. Lett. B 747 (2015) 468. R. Aaij et al. (the LHCb collaboration). 24/03/2015. 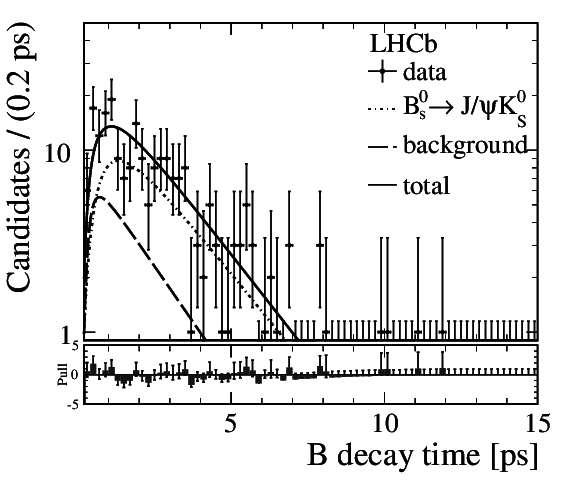 LHCb-PAPER-2015-009. arXiv:1503.07138 [hep-ex]. JHEP 06 (2015) 115. LHCb-PAPER-2015-004. arXiv:1503.07089 [hep-ex]. Phys. Rev. Lett. 115 031601 (2015). R. Aaij et al. (the LHCb collaboration). 18/03/2015. LHCb-PAPER-2014-068. arXiv:1503.05362 [hep-ex]. JHEP 07 (2015) 166. R. Aaij et al. (the LHCb collaboration). 03/03/2015. LHCb-PAPER-2015-003. arXiv:1503.00963 [hep-ex]. JHEP 05 (2015) 109. R. Aaij et al. (the LHCb collaboration). 27/01/2015. LHCb-PAPER-2014-069. arXiv:1501.06777 [hep-ex]. JHEP 04 (2015) 043. R. Aaij et al. (the LHCb collaboration). 24/12/2014. LHCb-PAPER-2014-064. arXiv:1412.7654 [hep-ex]. JHEP 05 (2015) 019. R. Aaij et al. (the LHCb collaboration). 10/12/2014. R. Aaij et al. (the LHCb collaboration). 25/11/2014. V. Khachatryan et al. (the CMS and LHCb collaborations). 17/11/2014. LHCb-PAPER-2014-049. arXiv:1411.4413 [hep-ex]. Nature 522, 68 (2015). Read the news on the LHCb web site, and the CERN press release. R. Aaij et al. (the LHCb collaboration). 11/11/2014. LHCb-PAPER-2014-050. arXiv:1411.2943 [hep-ex]. Phys. Rev. Lett. 114, 132001 (2015). R. Aaij et al. (the LHCb collaboration). 05/11/2014. LHCb-PAPER-2014-055. arXiv:1411.1264 [hep-ex]. JHEP 01 (2015) 064. R. Aaij et al. (the LHCb collaboration). 15/10/2014. LHCb-PAPER-2014-054. arXiv:1410.4170 [hep-ex]. Phys. Lett. B 740 (2015) 158. R. Aaij et al. (the LHCb collaboration). 30/09/2014. LHCb-PAPER-2014-053. arXiv:1409.8586 [hep-ex]. Phys. Rev. Lett. 114, 041601 (2015). LHCb-PAPER-2014-052. arXiv:1409.8548 [hep-ex]. JHEP 02 (2015) 121. R. Aaij et al. (the LHCb collaboration). 11/09/2014. LHCb-PAPER-2014-029. arXiv:1409.3612 [hep-ex]. Eur. Phys. J. C75 (2015) 311. R. Aaij et al. (the LHCb collaboration). 22/08/2014. LHCb-PAPER-2014-044. arXiv:1408.5373 [hep-ex]. Phys. Rev. D 90, 112004. R. Aaij et al. (the LHCb collaboration). 19/08/2014. LHCb-PAPER-2014-033. arXiv:1408.4354 [hep-ex]. JHEP 12 (2014) 79. R. Aaij et al. (the LHCb collaboration). 06/08/2014. LHCb-PAPER-2014-046. arXiv:1408.1299 [hep-ex]. JHEP 10 (2014) 005. R. Aaij et al. (the LHCb collaboration). 05/08/2014. LHCb-PAPER-2014-032. arXiv:1408.0978 [hep-ex]. JHEP 09 (2014) 177. R. Aaij et al. (the LHCb collaboration). 04/08/2014. LHCb-PAPER-2014-042. arXiv:1408.0275 [hep-ex]. Phys. Lett. B 739 (2014) 218. R. Aaij et al. (the LHCb collaboration). 29/07/2014. LHCb-PAPER-2014-031. arXiv:1407.7734 [hep-ex]. Eur. Phys. J. C 74 (2014) 3092. LHCb-PAPER-2014-035. arXiv:1407.7574 [hep-ex]. Phys. Rev. Lett. 113 162001 (2014). R. Aaij et al. (the LHCb collaboration). 23/07/2014. LHCb-PAPER-2014-017. arXiv:1407.6211 [hep-ex]. Nucl. Phys. B 888 (2014) 169. R. Aaij et al. (the LHCb collaboration). 22/07/2014. LHCb-PAPER-2014-027. arXiv:1407.5973 [hep-ex]. J. Phys. G 41 (2014) 115002. LHCb-PAPER-2014-037. arXiv:1407.5873 [hep-ex]. Phys. Rev. Lett. 113 172001 (2014). R. Aaij et al. (the LHCb collaboration). 08/07/2014. LHCb-PAPER-2014-025. arXiv:1407.2126 [hep-ex]. Phys. Rev. D 90, 032009 (2014). R. Aaij et al. (the LHCb collaboration). 25/06/2014. LHCb-PAPER-2014-024. arXiv:1406.6482 [hep-ex]. Phys. Rev. Lett. 113, 151601 (2014). R. Aaij et al. (the LHCb collaboration). 11/06/2014. LHCb-PAPER-2014-022. arXiv:1406.2885 [hep-ex]. JHEP 09 (2014) 030. LHCb-PAPER-2014-020. arXiv:1406.0755 [hep-ex]. JHEP 07 (2014) 103. R. Aaij et al. (the LHCb collaboration). 27/05/2014. LHCb-PAPER-2014-004. arXiv:1405.6842 [hep-ex]. JHEP 08 (2014) 143. R. Aaij et al. (the LHCb collaboration). 19/05/2014. LHCb-PAPER-2014-019. arXiv:1405.4140 [hep-ex]. Phys. Lett. B 736 (2014) 186. R. Aaij et al. (the LHCb collaboration). 12/05/2014. LHCb-PAPER-2014-013. arXiv:1405.2797 [hep-ex]. JHEP 07 (2014) 041. R. Aaij et al. (the LHCb collaboration). 23/04/2014. LHCb-PAPER-2014-012. arXiv:1404.5673 [hep-ex]. Phys. Rev. D 90, 012003 (2014). R. Aaij et al. (the LHCb collaboration). 01/04/2014. LHCb-PAPER-2014-009. arXiv:1404.0287 [hep-ex]. JHEP 05 (2014) 148. R. Aaij et al. (the LHCb collaboration). 31/03/2014. LHCb-PAPER-2014-007. arXiv:1403.8045 [hep-ex]. JHEP 05 (2014) 82. R. Aaij et al. (the LHCb collaboration). 14/03/2014. LHCb-PAPER-2014-002. arXiv:1403.3606 [hep-ex]. Phys. Rev. Lett. 112, 202001 (2014). R. Aaij et al. (the LHCb collaboration). 28/02/2014. Read the news on the LHCb site. R. Aaij et al. (the LHCb collaboration). 25/02/2014. LHCb-PAPER-2014-003. arXiv:1402.6242 [hep-ex]. Phys. Lett. B 734 (2014) 122. R. Aaij et al. (the LHCb collaboration). 13/02/2014. LHCb-PAPER-2013-068. arXiv:1402.2982 [hep-ex]. Phys. Lett. B 733 (2014) 36. R. Aaij et al. (the LHCb collaboration). 11/02/2014. LHCb-PAPER-2013-066. arXiv:1402.2539 [hep-ex]. Eur. Phys. J. C 74 (2014) 2835. R. Aaij et al. (the LHCb collaboration). 27/01/2014. LHCb-PAPER-2013-063. arXiv:1401.6932 [hep-ex]. Eur. Phys. J. C 74 (2014) 2839. R. Aaij et al. (the LHCb collaboration). 14/01/2014. LHCb-PAPER-2013-059. arXiv:1401.3288 [hep-ex]. J. Phys. G 41 (2014) 055002. R. Aaij et al. (the LHCb collaboration). 19/11/2013. LHCb-PAPER-2013-056. arXiv:1311.4823 [hep-ex]. Phys. Rev. D 89, 032001 (2014). R. Aaij et al. (the LHCb collaboration). 29/10/2013. LHCb-PAPER-2013-057. arXiv:1310.7953 [hep-ex]. Phys. Lett. B 728 (2014) 585. R. Aaij et al. (the LHCb collaboration). 17/10/2013. LHCb-PAPER-2013-051. arXiv:1310.4740 [hep-ex]. Phys. Rev. Lett. 112, 011801 (2014). R. Aaij et al. (the LHCb collaboration). 09/10/2013. LHCb-PAPER-2013-049. arXiv:1310.2538 [hep-ex]. JHEP 12 (2013) 090. R. Aaij et al. (the LHCb collaboration). 25/09/2013. R. Aaij et al. (the LHCb collaboration). 03/09/2013. LHCb-PAPER-2013-047. arXiv:1309.0587 [hep-ex]. JHEP 11 (2013) 094. R. Aaij et al. (the LHCb collaboration). 27/08/2013. LHCb-PAPER-2013-045. arXiv:1308.5916 [hep-ex]. Phys. Rev. D 88, 072005 (2013). R. Aaij et al. (the LHCb collaboration). 21/08/2013. LHCb-PAPER-2013-035. arXiv:1308.4583 [hep-ex]. Phys. Lett. B 727 (2013) 403. R. Aaij et al. (the LHCb collaboration). 08/08/2013. LHCb-PAPER-2013-037. arXiv:1308.1707 [hep-ex]. Phys. Rev. Lett. 111, 191801 (2013). R. Aaij et al. (the LHCb collaboration). 06/08/2013. R. Aaij et al. (the LHCb collaboration). 05/08/2013. LHCb-PAPER-2013-038. arXiv:1308.0961 [hep-ex]. JHEP 10 (2013) 005. R. Aaij et al. (the LHCb collaboration). 29/07/2013. LHCb-PAPER-2013-039. arXiv:1307.7595 [hep-ex]. Phys. Rev. Lett. 111, 112003 (2013). R. Aaij et al. (the LHCb collaboration). 23/07/2013. LHCb-PAPER-2013-031. arXiv:1307.6165 [hep-ex]. Phys. Rev. D 88, 052015 (2013). R. Aaij et al. (the LHCb collaboration). 19/07/2013. LHCb-PAPER-2013-030. arXiv:1307.4889 [hep-ex]. Phys. Rev. Lett. 111, 141801 (2013). R. Aaij et al. (the LHCb collaboration). 16/07/2013. LHCb-PAPER-2013-028. arXiv:1307.4285 [hep-ex]. JHEP 10 (2013) 115. R. Aaij et al. (the LHCb collaboration). 09/07/2013. LHCb-PAPER-2013-032. arXiv:1307.2476 [hep-ex]. Phys. Rev. Lett. 111 102003 (2013). R. Aaij et al. (the LHCb collaboration). 19/06/2013. LHCb-PAPER-2013-029. arXiv:1306.4489 [hep-ex]. JHEP 09 (2013) 006. R. Aaij et al. (the LHCb collaboration). 11/06/2013. LHCb-PAPER-2013-025. arXiv:1306.2577 [hep-ex]. Phys. Lett. B 725 (2013) 25. R. Aaij et al. (the LHCb collaboration). 06/06/2013. LHCb-PAPER-2013-027. arXiv:1306.1246 [hep-ex]. Phys. Rev. Lett. 111 101801 (2013). R. Aaij et al. (the LHCb collaboration). 22/05/2013. LHCb-PAPER-2013-013. arXiv:1305.5059 [hep-ex]. Phys. Lett. B 725 (2013), 15. R. Aaij et al. (the LHCb collaboration). 09/05/2013. LHCb-PAPER-2013-020. arXiv:1305.2050 [hep-ex]. Phys. Lett. B 726 (2013), 151. R. Aaij et al. (the LHCb collaboration). 23/04/2013. LHCb-PAPER-2013-016. arXiv:1304.6977 [hep-ex]. JHEP 06 (2013) 64. LHCb-PAPER-2013-018. arXiv:1304.6173 [hep-ex]. Phys. Rev. Lett. 110 (2013) 221601. LHCb-PAPER-2013-010. arXiv:1304.4530 [hep-ex]. Phys. Rev. D 87, 11( 2013) 112012. LHCb-PAPER-2013-015. arXiv:1304.4500 [hep-ex]. Nucl. Phys. B 873 (2013) 275. R. Aaij et al. (the LHCb collaboration). 09/04/2013. LHCb-PAPER-2013-002. arXiv:1304.2600 [hep-ex]. Phys. Rev. D 87, 112010 (2013). R. Aaij et al. (the LHCb collaboration). 28/03/2013. LHCb-PAPER-2012-047. arXiv:1303.7133 [hep-ex]. Eur. Phys. J. C 73 (2013) 2462. R. Aaij et al. (the LHCb collaboration). 27/03/2013. LHCb-PAPER-2012-046. arXiv:1303.6861 [hep-ex]. Phys. Rev. D 87, 092001 (2013). R. Aaij et al. (the LHCb collaboration). 19/03/2013. LHCb-PAPER-2012-055. arXiv:1303.4646 [hep-ex]. Phys. Lett. B 723 (2013) 44. R. Aaij et al. (the LHCb collaboration). 07/03/2013. LHCb-PAPER-2012-054. arXiv:1303.1737 [hep-ex]. Phys. Rev. D 87, 071103(R) (2013). R. Aaij et al. (the LHCb collaboration). 26/02/2013. LHCb-PAPER-2012-056. arXiv:1302.6446 [hep-ex]. Phys. Rev. D 87, 071101(R) (2013). R. Aaij et al. (the LHCb collaboration). 25/02/2013. R. Aaij et al. (the LHCb collaboration). 22/02/2013. R. Aaij et al. (the LHCb collaboration). 06/02/2013. LHCb-PAPER-2012-040. arXiv:1302.1213 [hep-ex]. Phys. Rev. D 87, 072004 (2012). R. Aaij et al. (the LHCb collaboration). 30/01/2013. R. Aaij et al. (the LHCb collaboration). 22/01/2013. LHCb-PAPER-2012-037. arXiv:1301.5286 [hep-ex]. JHEP 04 (2013) 001. R. Aaij et al. (the LHCb collaboration). 20/12/2012. LHCb-PAPER-2012-042. arXiv:1212.5205 [hep-ex]. JHEP 03 (2013) 067. R. Aaij et al. (the LHCb collaboration). 19/12/2012. LHCb-PAPER-2012-036. arXiv:1212.4620 [hep-ex]. JHEP 02 (2013) 106. R. Aaij et al. (the LHCb collaboration). 26/11/2012. LHCb-PAPER-2012-035. arXiv:1211.6093 [hep-ex]. Phys. Lett. B 721 (2013) 24. R. Aaij et al. (the LHCb collaboration). 12/11/2012. R. Aaij et al. (the LHCb collaboration). 06/11/2012. LHCb-PAPER-2012-038. arXiv:1211.1230 [hep-ex]. Phys. Rev. Lett. 110, 101802 (2013). R. Aaij et al. (the LHCb collaboration). 23/10/2012. LHCb-PAPER-2012-029. arXiv:1210.6289 [hep-ex]. JHEP 01 (2013) 111. R. Aaij et al. (the LHCb collaboration). 15/10/2012. LHCb-PAPER-2012-026. arXiv:1210.4112 [hep-ex]. Phys. Lett. B 718 (2013) 902-907. R. Aaij et al. (the LHCb collaboration). 09/10/2012. LHCb-PAPER-2012-020. arXiv:1210.2645 [hep-ex]. JHEP 1212 (2012) 125. R. Aaij et al. (the LHCb collaboration). 26/09/2012. LHCb-PAPER-2012-027. arXiv:1209.5869 [hep-ex]. Phys. Lett. B. 718 (2012) 43. R. Aaij et al. (the LHCb collaboration). 19/09/2013. R. Aaij et al. (the LHCb collaboration). 03/09/2012. LHCb-PAPER-2012-019. arXiv:1209.0313 [hep-ex]. Nucl. Phys. B 867 (2012) 1. A. Bharucha et al. (the LHCb collaboration) 16/08/2012. LHCb-PAPER-2012-031. arXiv:1208.3355 [hep-ex]. Eur. Phys. J. C 73 (2013) 2373. R. Aaij et al. (the LHCb collaboration). 25/07/2012. LHCb-PAPER-2012-018. arXiv:1207.5991 [hep-ex]. Phys. Rev. Lett. 109, 131801 (2012). LHCb-PAPER-2012-016. arXiv:1207.6016 [hep-ex]. JHEP 1210 (2012) 151. R. Aaij et al. (the LHCb collaboration). 22/06/2012. LHCb-PAPER-2011-037. arXiv:1206.5160 [hep-ex]. Eur. Phys. J. C 72 (2012) 2168. R. Aaij et al. (the LHCb collaboration). 15/05/2012. LHCb-PAPER-2012-012. arXiv:1205.3452 [hep-ex]. Phys. Rev. Lett. 109, 172003 (2012). R. Aaij et al. (the LHCb collaboration). 04/05/2012. LHCb-PAPER-2011-041. arXiv:1205.0934 [hep-ex]. Phys. Lett. B 713 (2012) 172. LHCb-PAPER-2012-010. arXiv:1205.0918 [hep-ex]. Eur. Phys. J. C 72 (2012) 2118. R. Aaij et al. (the LHCb collaboration). 06/04/2012. LHCb-PAPER-2011-045. arXiv:1204.1258 [hep-ex]. Eur. Phys. J. C 72 (2012) 2100. R. Aaij et al. (the LHCb collaboration). 31/03/2012. R. Aaij et al. (the LHCb collaboration). 16/03/2012. LHCb-PAPER-2012-001. arXiv:1203.3662 [hep-ex]. Phys. Lett. B 712 (2012), pp. 203-212. R. Aaij et al. (the LHCb collaboration). 29/02/2012. LHCb-PAPER-2011-036. arXiv:1202.6579 [hep-ex]. Eur. Phys. J. C 72 (2012) 6. R. Aaij et al. (the LHCb collaboration). 28/02/2012. LHCb-PAPER-2011-029. arXiv:1202.6251 [hep-ex]. Phys. Rev. Lett. 108 (2012) 201601. R. Aaij et al. (the LHCb collaboration). 23/02/2012. R. Aaij et al. (the LHCb collaboration). 21/02/2012. LHCb-PAPER-2011-028. arXiv:1202.4717 [hep-ex]. Phys. Rev. Lett. 108, 241801 (2012). R. Aaij et al. (the LHCb collaboration). 26/01/2012. LHCb-PAPER-2011-038. arXiv:1201.5600 [hep-ex]. Phys. Rev. D 85, 112004 (2012). R. Aaij et al. (the LHCb collaboration). 20/12/2011. LHCb-PAPER-2011-011. arXiv:1112.4592 [hep-ex]. Eur. Phys. J. C 72 (2012) 1947. LHCb-PAPER-2011-026. arXiv:1112.4695 [hep-ex]. Phys. Rev. Lett. 108, 151801 (2012). R. Aaij et al. (the LHCb collaboration). 15/12/2011. LHCb-PAPER-2011-020. arXiv:1112.3515 [hep-ex]. Phys. Rev. Lett. 108, 181806 (2012). R. Aaij et al. (the LHCb collaboration). 13/12/2011. LHCb-PAPER-2011-031. arXiv:1112.3056 [hep-ex]. Phys. Lett. B 707 (2012) 497. R. Aaij et al. (the LHCb collaboration). 05/12/2011. LHCb-PAPER-2011-023. arXiv:1112.0938 [hep-ex]. Phys. Rev. Lett. 108, 111602 (2012). CERN Courier. R. Aaij et al. (the LHCb collaboration). 11/11/2011. LHCb-PAPER-2011-018. arXiv:1111.2357 [hep-ex]. Phys. Rev. D 85, 032008 (2012). R. Aaij et al. (the LHCb collaboration). 18/10/2011. LHCb-PAPER-2011-017. arXiv:1110.3970 [hep-ex]. Phys. Rev. D 84, 112008 (2011). R. Aaij et al. (the LHCb collaboration). 13/10/2011. LHCb-PAPER-2011-015. arXiv:1110.2866 [hep-ex]. 2012 JINST 7 P01010. R. Aaij et al. (the LHCb collaboration). 30/09/2011. LHCb-PAPER-2011-016. arXiv:1109.6831 [hep-ex]. Phys. Rev. D 84, 092001 (2011). R. Aaij et al. (the LHCb collaboration). 20/07/2011. LHCb-PAPER-2011-007. arXiv:1107.3935 [hep-ex]. Phys. Lett. B 703 (2011) 267. R. Aaij et al. (the LHCb collaboration). 22/06/2011. LHCb-PAPER-2011-006. arXiv:1106.4435 [hep-ex]. Phys. Rev. Lett. 107 21 (2011). R. Aaij et al. (the LHCb collaboration). 02/03/2011. LHCb-PAPER-2011-003. arXiv:1103.0423 [hep-ex]. Eur. Phys. J. C 71 (2011) 1645. R. Aaij et al. (the LHCb collaboration). 02/02/2011. LHCb-PAPER-2011-002. arXiv:1102.0348 [hep-ex]. Phys. Lett. B 698 (2011) 14. R. Aaij et al. (the LHCb collaboration). 14/09/2010. LHCb-PAPER-2010-002. arXiv:1009.2731 [hep-ex]. Phys. Lett. B 694 (2010) 209. See See reports and reviews for more publications. R. Aaij et al. 06/08/2014. CERN-LHCb-DP-2013-002. arXiv:1408.1251 [hep-ex]. JINST 10 P0200 (2015). A. Bay, et al. 21/02/2010. Nucl. Instr. Meth. A614:34-40 (2010). Inspire record. G. Buchalla, T.K. Komatsubara, F. Muheim, et al. 11/01/2008. arXiv:0801.1833 [hep-ph]. Eur. Phys. J. C 57 (2008) 309. G. Corti, et al. 26/06/2006. Nuclear Science Symposium Conference Reord, 2004 IEEE. IEEE Trans.Nucl.Sci. 53 (2006) 1323-1328. Inspire record. By RD46 collaboration (J. Konijn et al.). Nucl. Instr. Meth. A 418 (1998) pp 186-195. Inspire record. Most of these journal publications are signed by many authors. I sign only those to which I actively contributed or which use results to which I contributed. The complete list of Belle publications can be found on the Belle web. Improved Evidence for Direct CP Violation in B0 → π+π– Decays and Model-Independent Constraints on φ2. K. Abe et al. (the Belle collaboration). 18/02/2005. arXiv:hep-ex/0502035. Phys. Rev. Lett. 95, 101801 (2005). arXiv:hep-ex/0403004. Phys. Rev. Lett. 93, 061803 (2004).